Here you can learn how to enable or disable Blogger comment feature. This setting will affect to the entire blog. So if you disable it here, readers won't find Blogger comment form on any of your pages. Further if you enable comments on your blog, you can select how you going to display your comment form or location of your comment form. Click on your Blog Title. Go to Posts and comments tab under Settings. Select Hide for Comment Location setting to hide comment form from your entire blog. But it doesn't delete comments already made on your blog. Else select embedded Full page or popup window options to enable comment form. Embedded - Comment form and comments will be embedded under the post on each page which you have enabled comments. Full page - Comment form and comments will display in another page, instead of displaying it on same page where your post. Popup window - Comment form and comments will display in a popup window. Here you will find the way to allow or disallow comments on your post pages. Post pages means pages where you display your content. In Blogger, by default, comments enabled for all your posts. In case if you wanna disable commenting feature for specific posts, you have to go through their post page options individually. Jump to Posts tab from left pane. Now hover on the post you wanna change comment feature and click Edit link correspond to it. Click on Options from right panel. There you can find the setting Reader comments and select the Allow option to enable comments or else select Don't allow option to disable comments for that specific post. 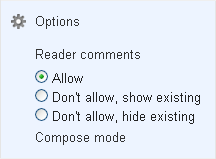 Note: If you got reader comments already on your post page, you will have to select either Don't allow, show existing or Don't allow, hide existing option if you wanna disable comments. 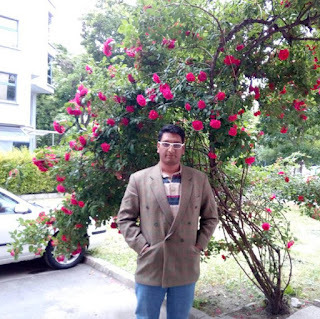 Now preview and Update your post. That's it you're all done.Do you like this post?Do share your view with us. I used to have disabled my comment box but enabled it last year.